Hi guys, I hope you all had a wonderful Easter holiday! We had a fun mini-vacation down south at Lego Land, and a quiet dinner at home on Sunday. I just wanted to pop in quickly to point you all over to our Recent News for our stock and website updates in case anyone missed them. Remember, you can subscribe to these feeds as well by clicking on the little RSS icon for Recent News from either the home page or the footer of the website. I'll be back soon with some new projects! It's Release Day! 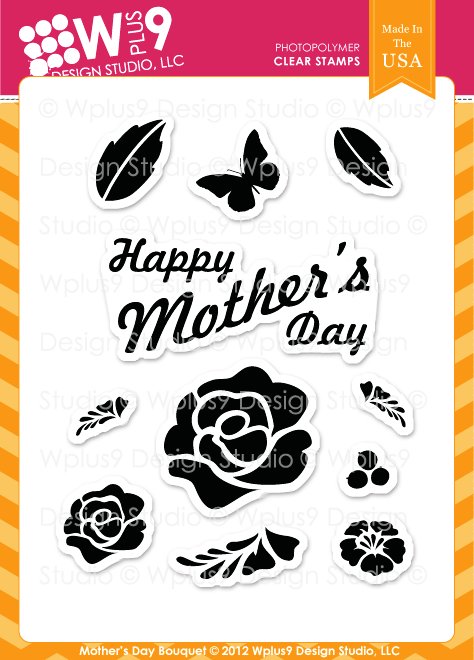 All of our April/May 2012 products are now available for purchase at www.wplus9.com. If you missed the release, you can start here to catch up. With the addition of card stock to the Wplus9 product line, we've had to adjust shipping rates and policies a bit. You can find all of the details here. Aren't they all wonderful?! As always, the Design Team hit it out of the park this week. 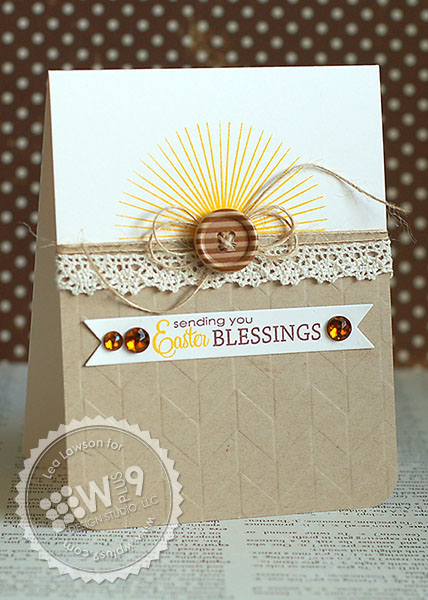 If you haven't seen the rest of their samples from the week, be sure to click on their names to check it out. Thanks to those of you who joined us this week! As promised, we've increased our starting inventories and will continue to do so as needed. We also have a die shipment expected early next week, so keep an eye out for a stock update. Thanks again! It's time for the full reveal! Time to show you the sets we are releasing this month in their entirety. All products will be available for purchase tomorrow, on April 5th at www.wplus9.com. As you review all of the product and details, you will notice that starting with this release, we are increasing the price of our 6x8 sets by about 10%. This small increase helps offset some of the increased expenses that we are incurring as we grow and will ensure that we are able to continue our growth, but still allows us to remain at a lower cost for you than many of our competitors. All previously released sets will remain at their previous price. approximate Measurements (inches) - 5.75" x 4.5"
So many of you have expressed enthusiasm over our addition of cardstock and Impression Plates. I wanted to give you some more details on this to help answer some of the questions I've been receiving. Will you be carrying more colors of cardstock? We are treating these first 3 colors as a beta run. 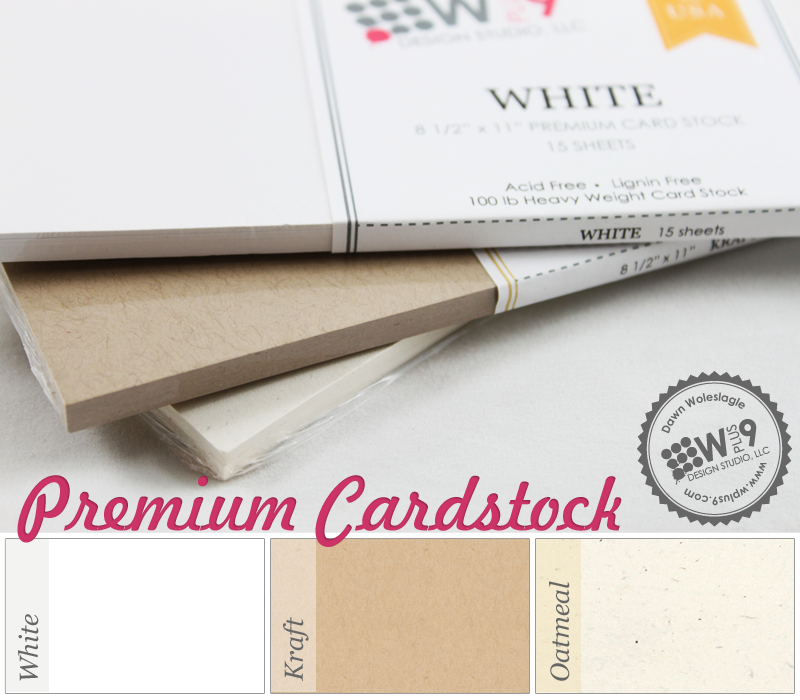 We want to ensure that we can successfully break into the market and supply quality cardstock that meets your needs and exceeds your expectations. Upon success, we plan to introduce a complete color line. Will these colors be available in larger quantities? A sampler pack? For this initial phase, we want to keep things on a scale that we will successfully be able to deliver. These are definitely in discussion and on the horizon once we have completed this launch. 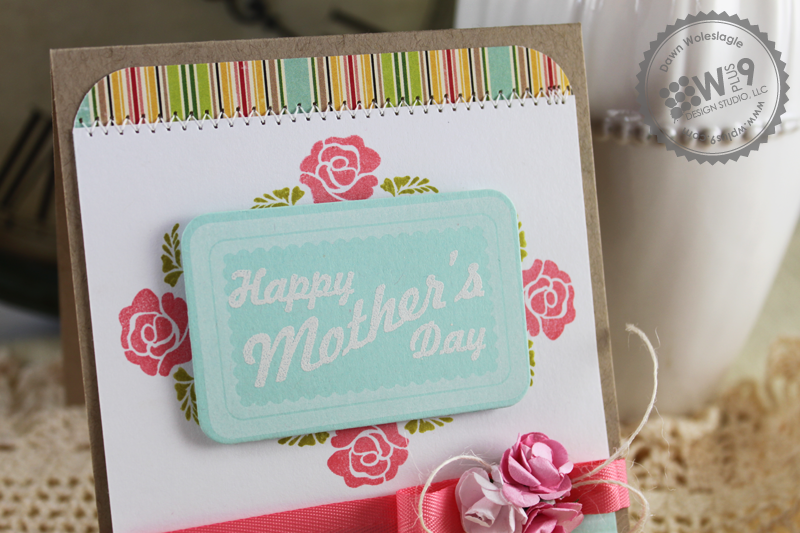 Will cardstock and Impression Plates be available for wholesale? 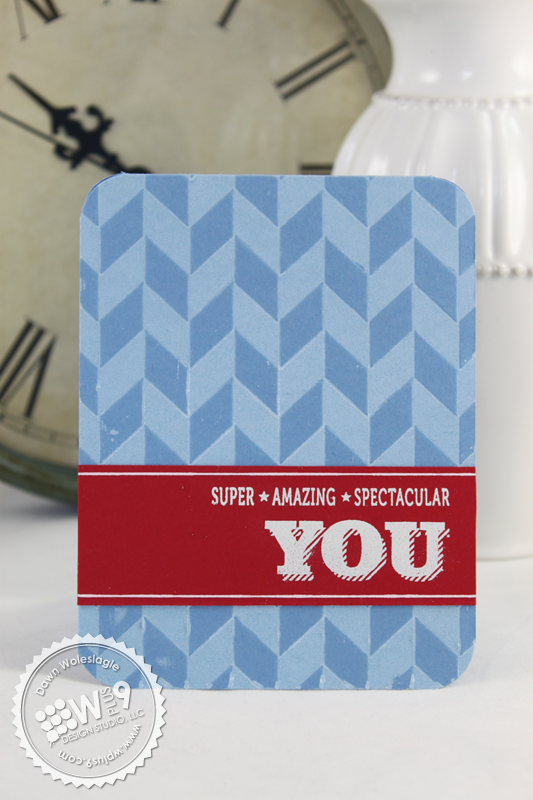 Initially cardstock will only be available direct-to-consumer on the website. Once we have a couple of months of sales trends to review we will adjust our stock accordingly and open up to wholesale. 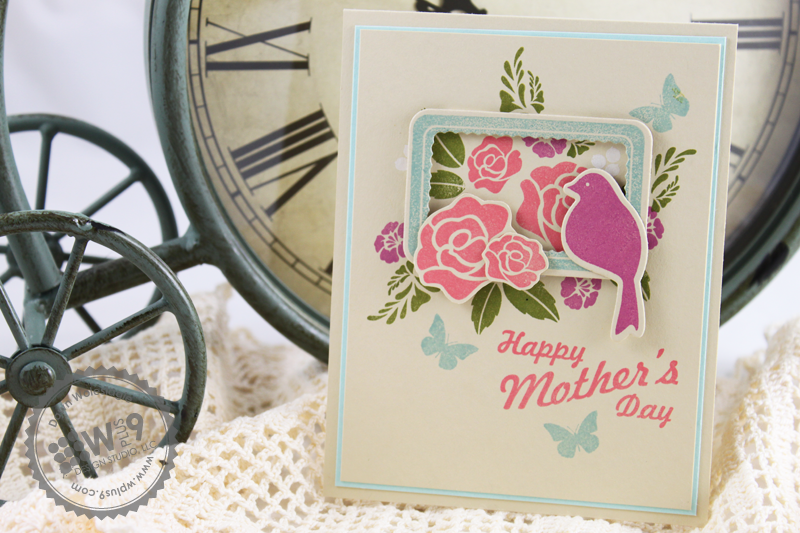 Impression Plates will be available for wholesale at the end of the month. I hope that answers some of your questions, and as always, I want to thank you for joining us for another release! I love seeing all of the new names, and of course, those who continue to support us each release. You guys are the greatest! How about one more giveaway? Want to win the entire release? 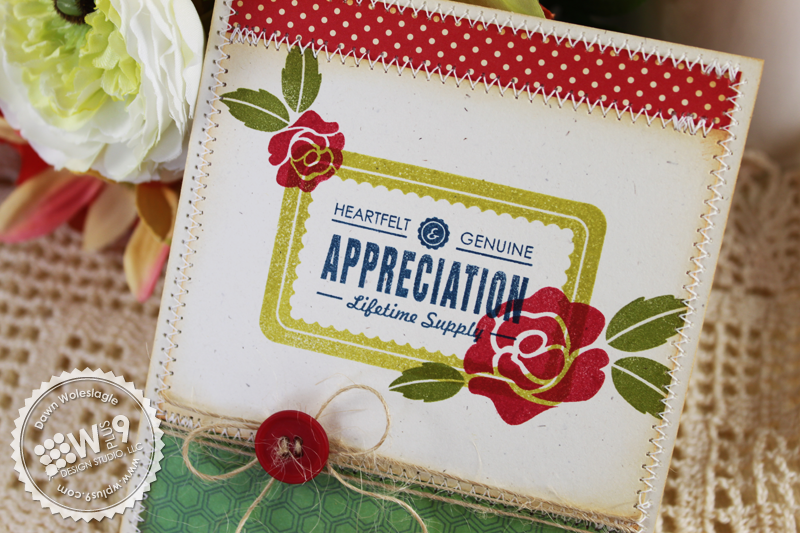 Just leave a comment by 10:00 PM EST TONIGHT April 4th to enter. I will select one random winner from all comments. Winners will be posted here by 11:00 PM EST. It's Day 3 of Release Week and we have a couple more items to introduce today! If you are just joining us, be sure to catch up starting with Day 1. All previewed items will be available for purchase on April 5th at www.wplus9.com. We have 1 new stamp set and a coordinating die, as well as our very first Impression plate to share with you, so let's get started with the details. 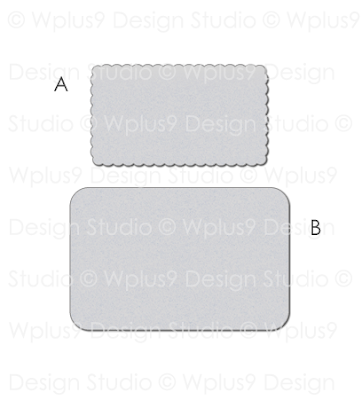 We are very pleased to announce that we are adding Impression plates to the Wplus9 line. These plates are manufactured by the same company as our Designer Dies. So you can expect the same high quality and lifetime guarantee that you've come to expect from Wplus9. First up, Label Layers 4 and it's companion the Label Layers 4 die. Label Layers 4 is graphic label set with a slightly retro feel to it. The matching die comes with 2 individual dies; a solid rectangle base and an inner scalloped rectangle. 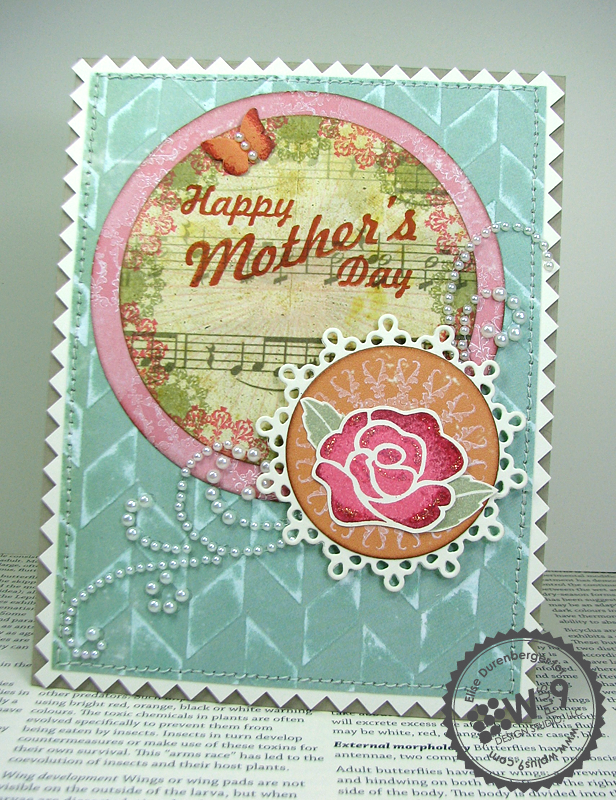 You can use them alone, together to cut a negative frame, or stacked together like I've done for my first card here. I stamped the frame onto our White card stock and die cut it using the base die from LL4. I die cut the inner rectangle from White card stock as well and stamped the sentiment "Hoot & Holla', It's Your Day!" onto it in navy and adhered it with foam tape onto the base. 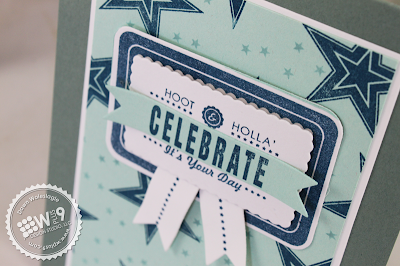 For the main "Celebrate" sentiment, I die cut the smallest banner from Banner Trio and stamped it in navy. 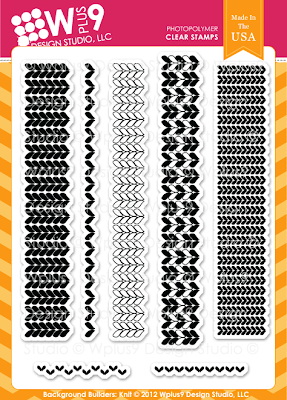 This is another set that works great with our previously released So 80's set. 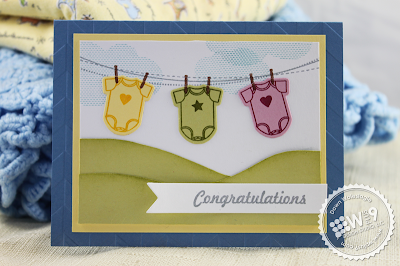 I used the stars to create a backdrop for the label. 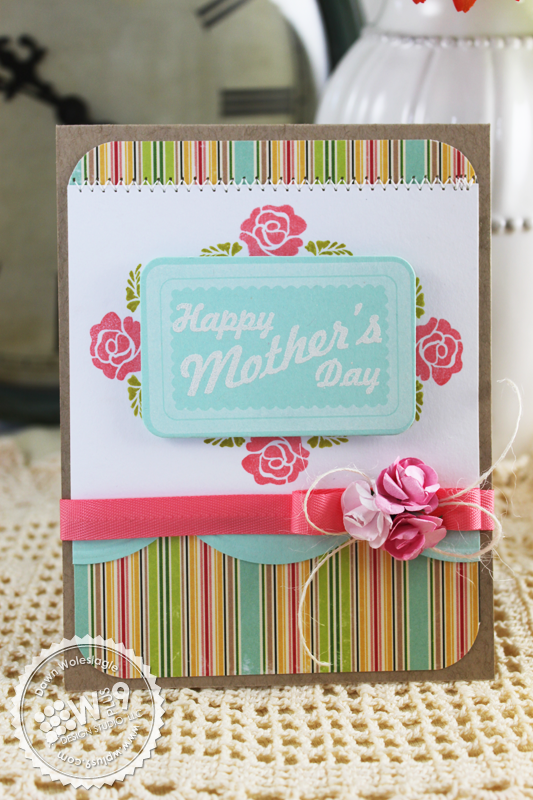 I finished this card off by using the middle sized banner from Banner Trio as faux ribbon tails. 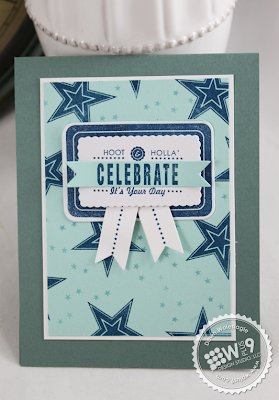 I cut it in half, stamped it with the row of stars included in Label Layers 4 and tucked it under the label. 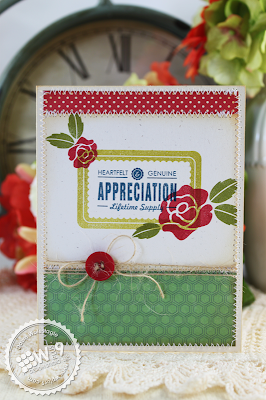 Another option for the Label Layers 4 die is to use just the base layer and use other sentiments from your stash to fit any genre you'd like. 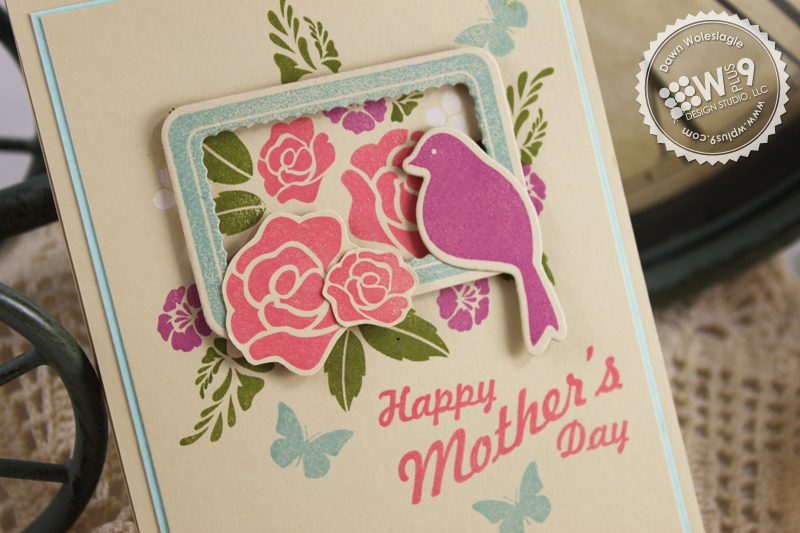 Here, I've stamped the frame onto the base die cut and embossed the Mother's Day sentiment from Mother's Day Bouquet in white. To make the simple treatment stand out more, I created another frame using a couple of the floral images also from Mother's Day Bouquet. 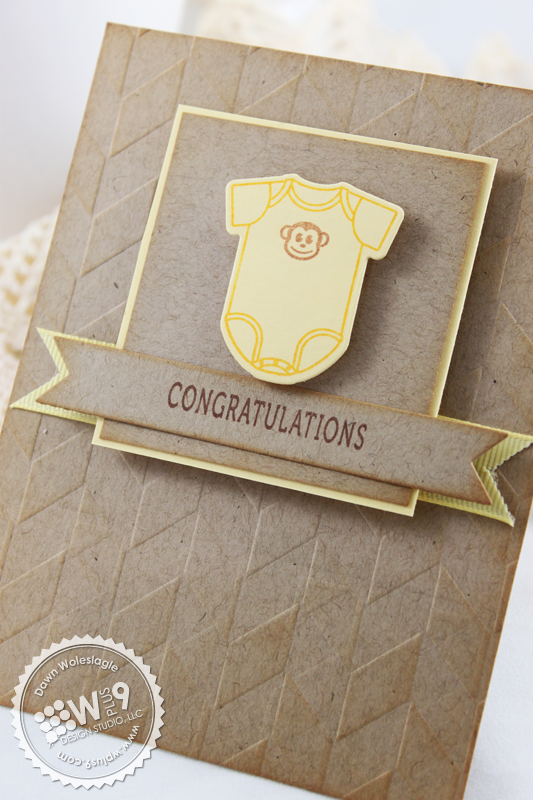 For the next example, I wanted to show how amazing the Label Layers 4 stamp set looks when used on it's own. 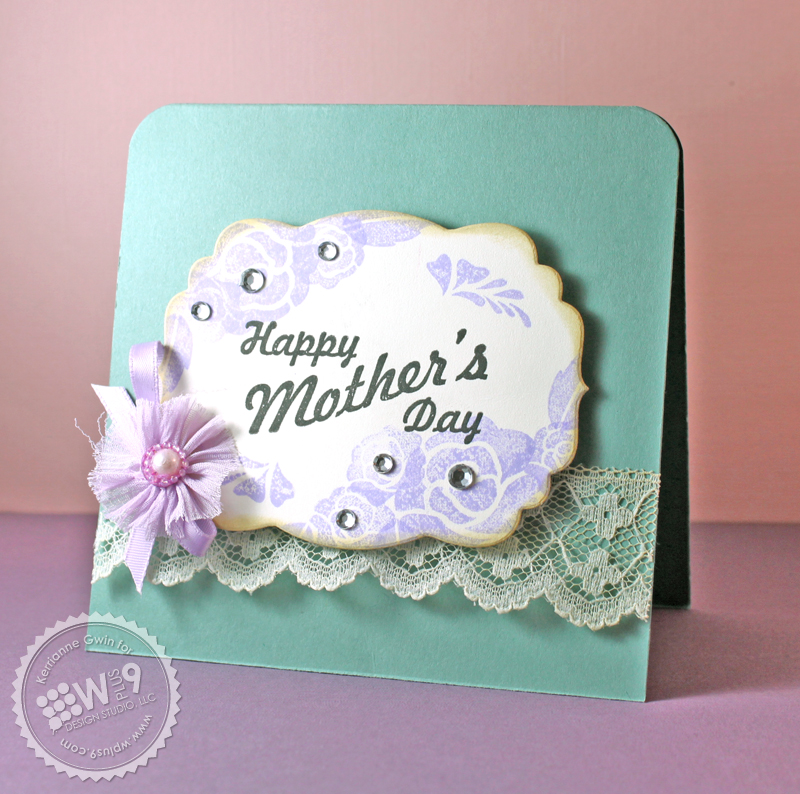 For this card, I started with an Oatmeal card stock panel and stamped the frame in green. I added my sentiments in navy and added some flowers to each corner from Mother's Day Bouquet. 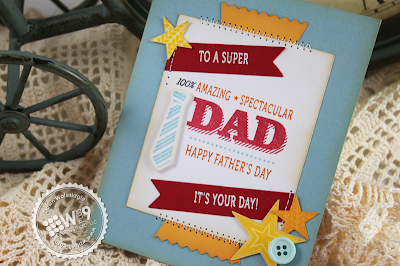 I didn't even bother with masking here as I going for a more care-free and homespun feel. Perfectly imperfect. I'm actually really excited about this one. I'll start by saying that I had my fingers crossed when this one came in and I was NOT disappointed. In fact, I love it more in reality than I did in concept. Love it when that happens! Do you see that pattern!? 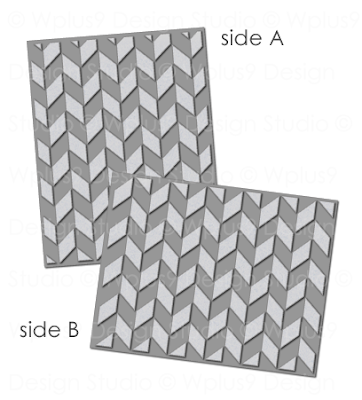 That would be our new Chevron Impression Plate. The really cool thing about this plate is that the impression it leaves is almost like those holographic cards. The pattern actually shifts depending on how the light catches it. From one angle it looks like a chevron, from another, like a herringbone pattern. And from yet another it looks like broken diagonal lines. It is so cool. 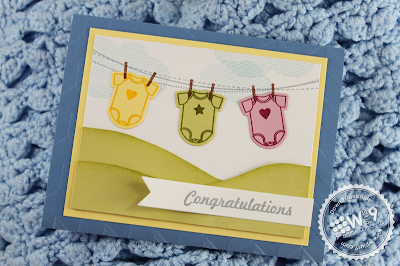 Here, I thought it would be perfect for a soft baby card. 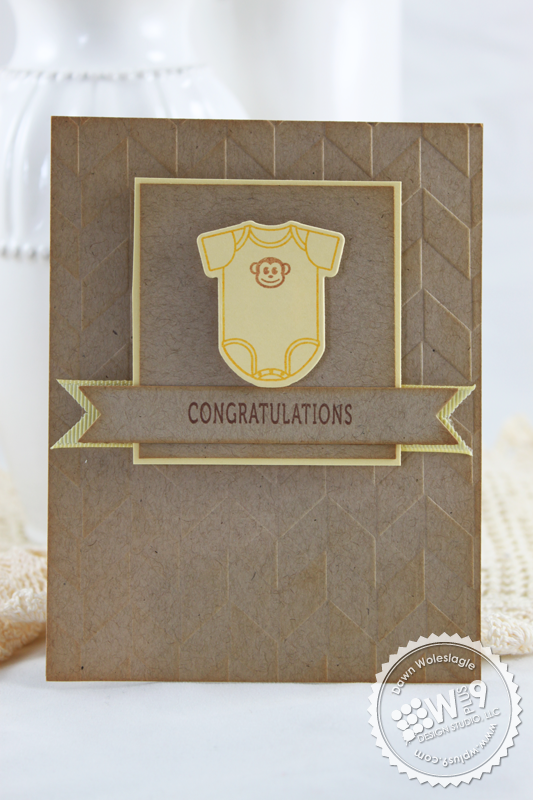 The chevron pattern and the simple design creates a such a sophisticated look paired with Onesie Twosie. The Chevron Impression Plate has two sides. 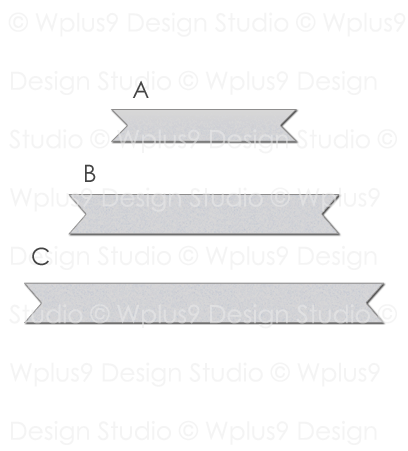 Both sides are the same scale with Side A set up vertically and Side B set up horizontally. Here I've used it horizontally to mat a little scene. 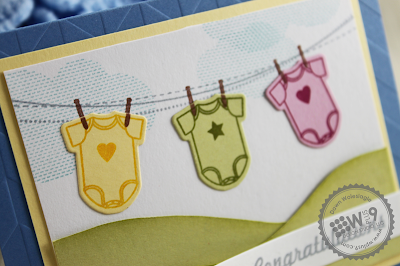 I couldn't help but pair the small onesies from Onesie Twosie with the clothesline from Heartfelt Mix. Again, the embossed pattern lends a little sophistication to an otherwise whimsical card. And finally, I wanted to try a little faux letterpress. I simply used a brayer to apply white ink (from a re-inker, squeezed onto acetate) directly to the impression plate and ran it through the Big Shot. Note: this is very messy and not for the impatient or neat freak. Despite how "easy" tutorials make it look. It's not clean and it won't be perfect the first (or possibly the third) time. But...it does look cool. 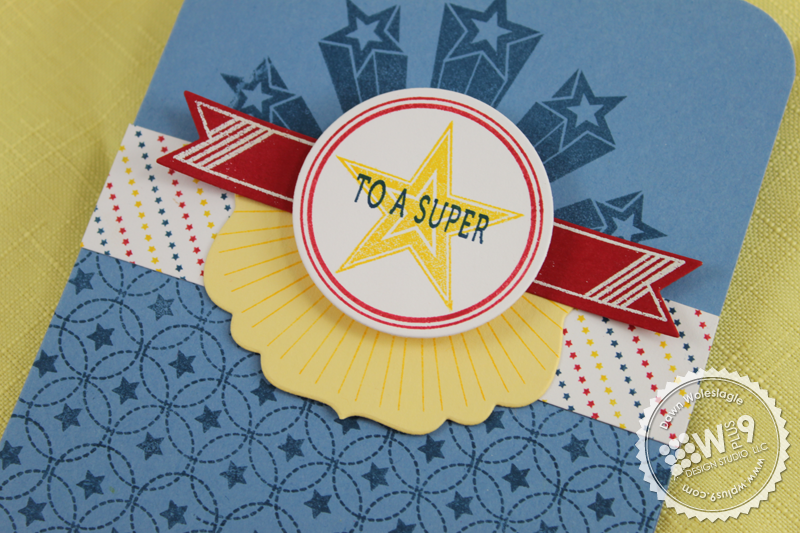 I wanted to let all of the hard work take center stage, so I just added a sentiment from Super Star embossed in white onto a red strip. I added a line to the top and bottom by using a ruler and a white gel pen. That's it for today! Be sure to come back tomorrow for the full reveal and all of the details on everything we are releasing. 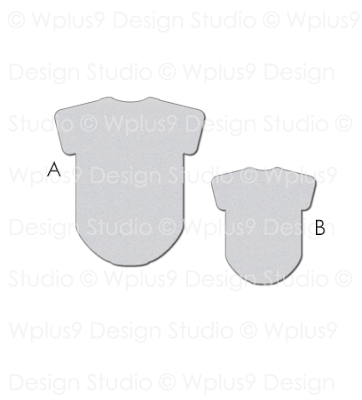 But before you go, the Design Team has lot's to share with you too. 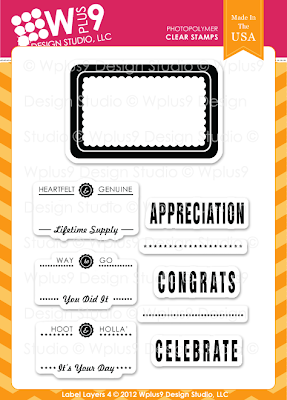 Would you like to win Label Layers 4, the Label Layers 4 Companion Die and the Chevron Impression Plate? 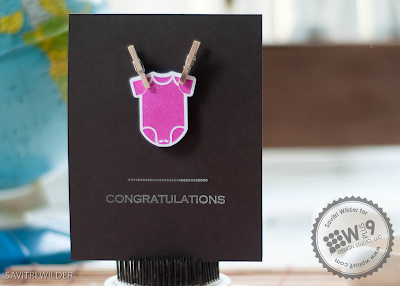 Just leave me a comment by 9:00 AM EST April 4th to enter. I will select one random winner from all comments. Winners will be posted here. The fun continues tomorrow with more from this release and more chances to win, hope to see you then! Welcome back to day 2 of Release Week! I want to thank you all for the incredible response yesterday! I am truly very grateful for each and every one of you who not only supports Wplus9, but takes the time to share your enthusiasm as well. If you are just joining us, be sure to catch up starting with Day 1. All previewed items will be available for purchase on April 5th at www.wplus9.com. 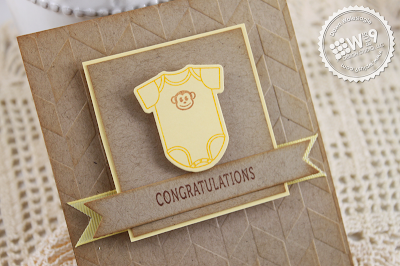 We have 2 new stamp sets and 2 new dies to share today, so let's get started with the introductions. 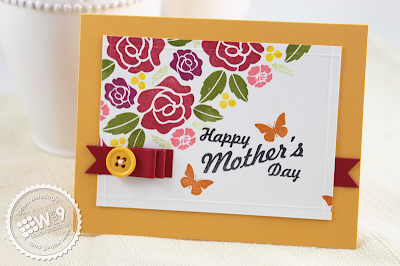 Yesterday we covered wedding and baby, so naturally today we are going to be looking at Mother's Day and Father's Day. So let's start by taking a closer look at Mother's Day Bouquet, a mini set with big possibilities. 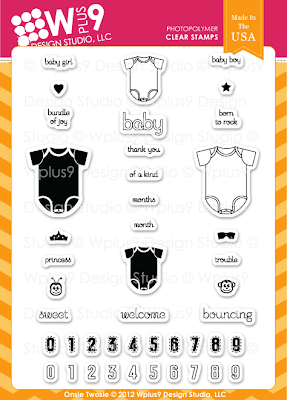 Traditionally all sets have been illustrated exclusively for Wplus9. 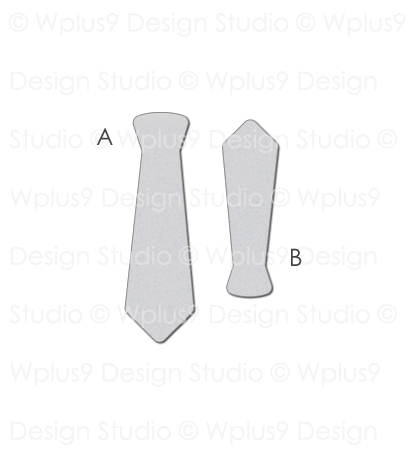 This is the first set that contains a licensed image. 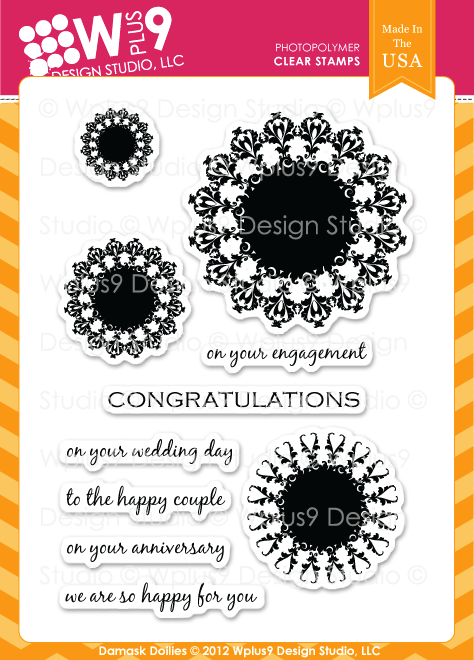 I fell in love with the smallest flower in this set when I was looking for inspiration and was so happy to see that I could contact the illustrator directly to purchase a license. This way I am able to support a fellow artist and I know that they are receiving all of the licensing fee. You know what they say, "Good things come in small packages. ", and here is a prime example. 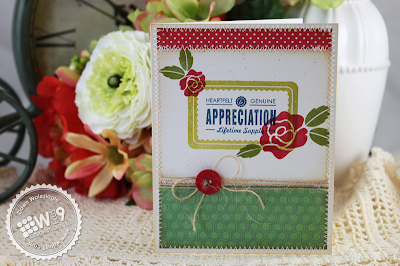 For today's card, I used the different flowers and foliage included in this set to create a bouquet of flowers. To fame the focal point, I used Label Layers 4 stamp and die cut (more on that tomorrow). 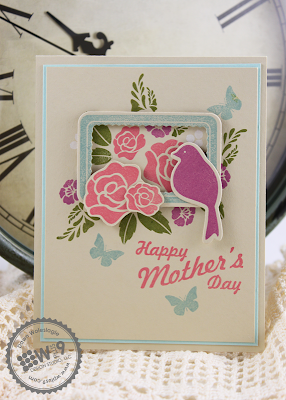 I die cut a bird and stamped it using Love Birds and the Love Birds die to perch on one corner. To the other side added some fussy cut roses. To finish, I added some scattered butterflies and the large sentiment, also included in Mother's Day Bouquet. My next card uses a super bright and cheery color palette. I have some sort of love affair going on with red and orange lately, which in all honesty seems like it would break every design rule...but hey, I like it. 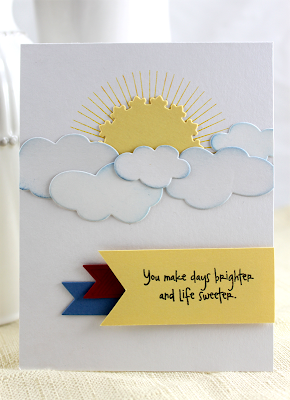 The focus here is all about those bold blooms against our stark White card stock. To separate the sentiment from the floral image, I added a banner using our Banner Trio die flanking each side of the sentiment. Did you wonder why you were seeing so many banners in the samples? Normally, I would not create a die for something so easy to hand cut. 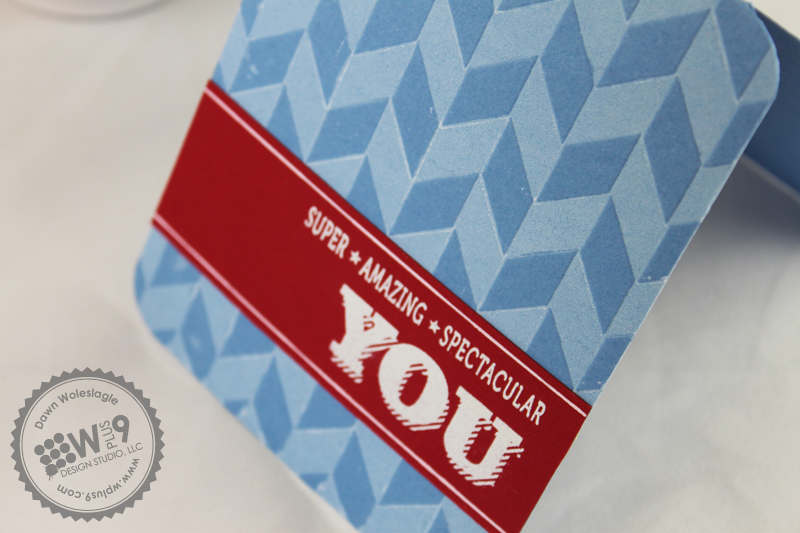 But I have become quite spoiled with the beautiful edges you get from die cutting vs. hand cutting. 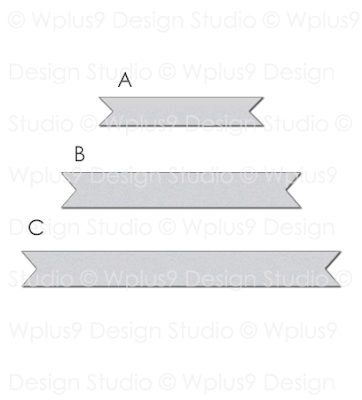 Plus, the Banner Trio die has 3 sizes in one if you don't separate the die, so I always have extras already cut and ready to be added to a project. 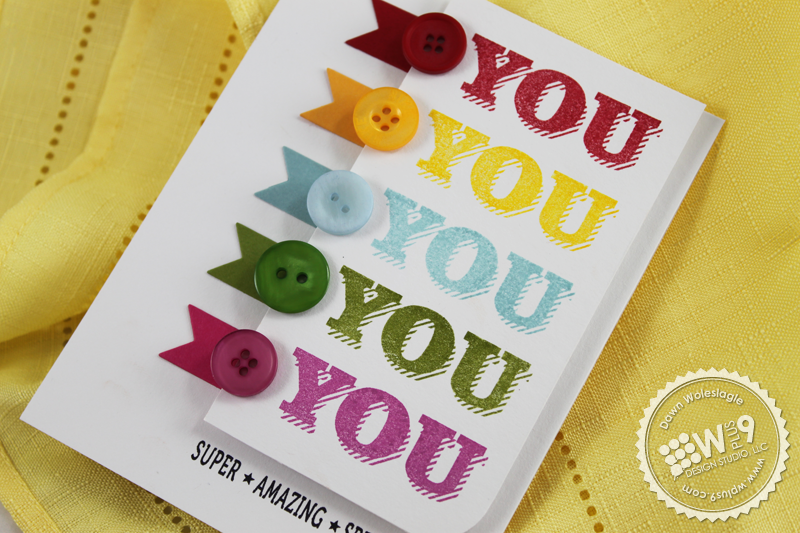 This makes the lazy crafter in me very happy! Now let's take a look at Super Star. 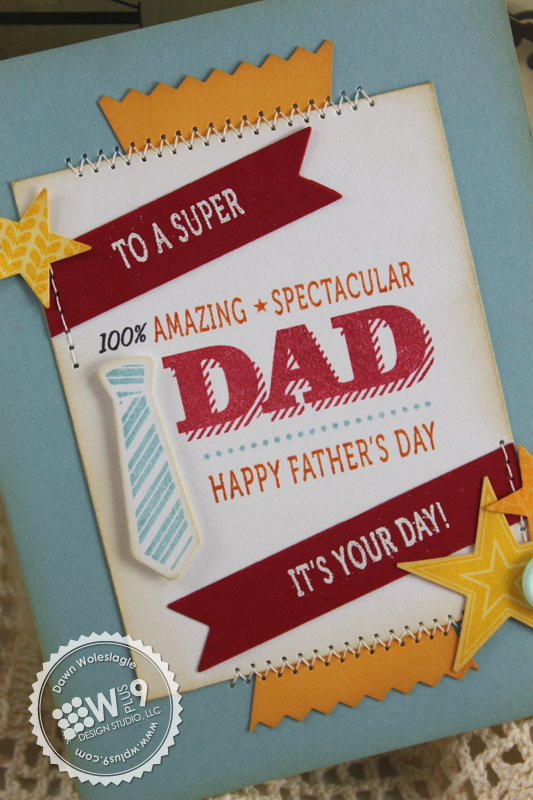 I always try to make our sets as versatile as possible, so you will be so happy to see that this set can be used for so much more than just Father's Day. It will truly be a go to set that you can use all year. Oh yeah, dad and that iconic tie just got a little retro with a modern spin! I started by using the sentiments included in Super Star to create another subway poster type greeting. I used one of the ties along with the small tie from the Tie Die to represent "dad". I started and ended the sentiment by splitting it on a banner cut in half and flanking the top and bottom. I think the large star from So 80's and a couple of small stars stamped with Background Builders: Knit finishes the card perfectly. 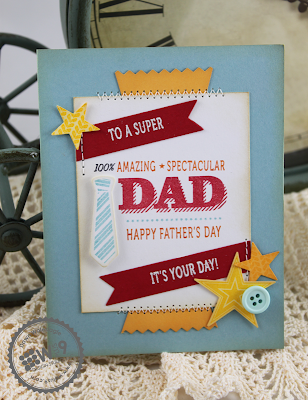 This next card is my favorite today, and is a great example of when those banner dies come in handy. 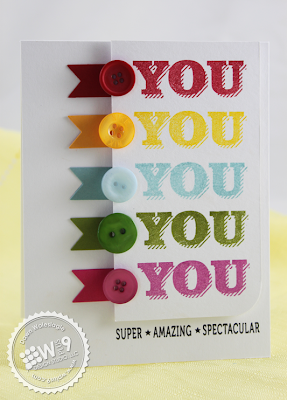 LOVE the big YOU sentiment in Super Star. 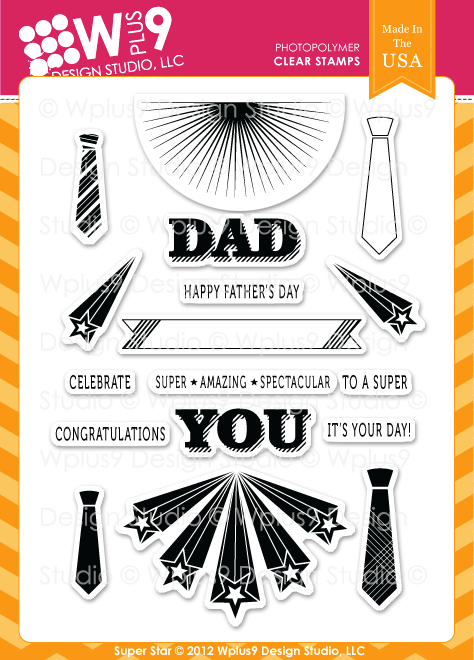 For many of the sentiments in this set, you can switch out "DAD" for "YOU" and this set instantly becomes appropriate for anyone. Here, I stamped "YOU" repeatedly in a vertical line in various colors. 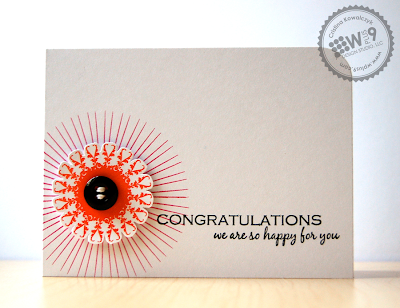 To carry the colors across the card, I added a coordinating button and banner. Using the Banner Trio die ensured that all of my banners were uniform. 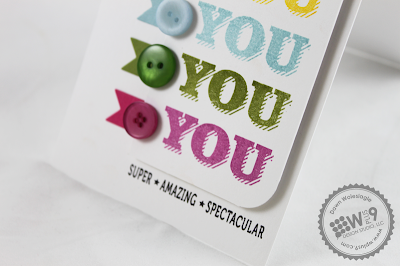 I stamped the sentiment "SUPER AMAZING SPECTACULAR" in black to finish this bold statement. My final sample today, showcases the 2 star burst images included in Super Star.I love big, bold and graphic images. 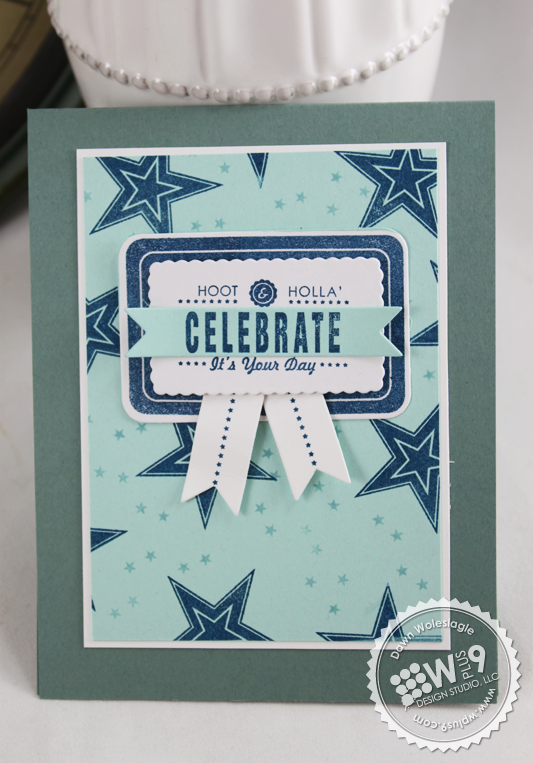 Here I stamped the large shooting stars in Not Quite Navy onto a blue card base and stamped the lower half of the card base with Design Basics: Backgrounds 1. The star border was created using a small strip of stars from Label Layers 4. 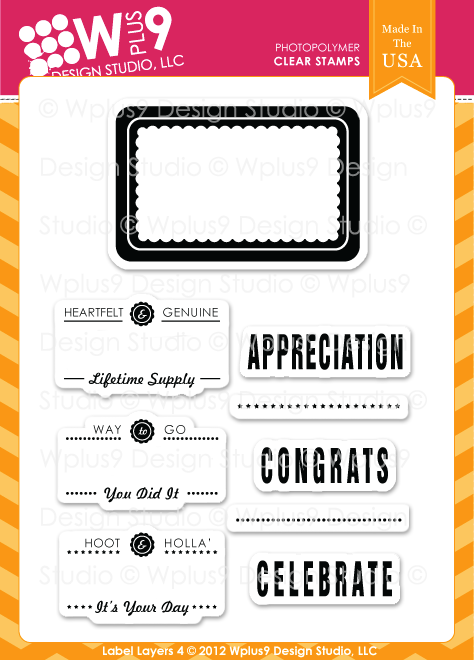 To balance the stars at the top, I stamped the star burst image included on this set in yellow onto a Label Layers 2 die cut and cut it in half. 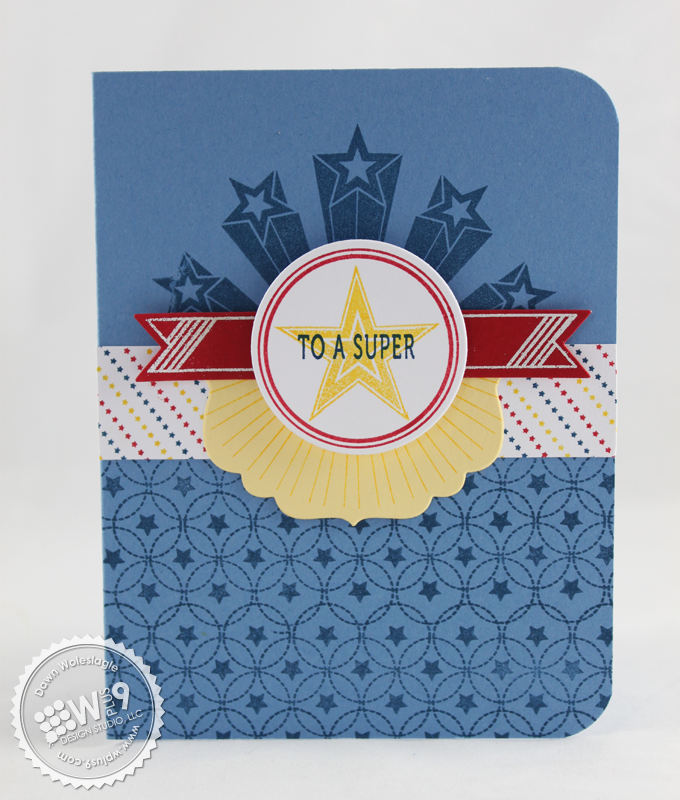 I used the star from So 80's again to finish off the sentiment, "TO A SUPER STAR". That's all I have today, but I'll be back tomorrow with the rest of our release and our very first Impression Plate! But for now, the Design Team has lot's to share with you too. 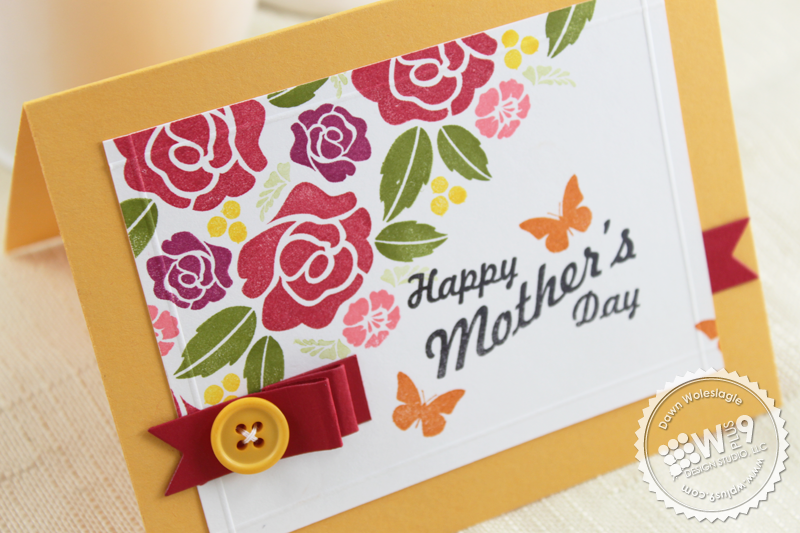 Would you like to win Mother's Day Bouquet, Super Star, the Tie Die and the Banner Trio Die? Just leave me a comment by 9:00 AM EST April 3rd to enter. I will select one random winner from all comments. Winners will be posted here.